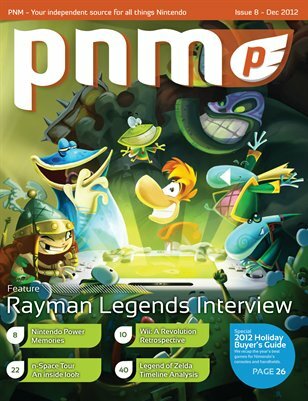 Our 8th issue of Pure Nintendo Magazine is chalk full of Nintendo goodness. We interview the Lead Game Designer for Rayman Legends, the sequel to Rayman Origins. Also in this issue, get an inside look at game developer, n-Space. Nintendo Power recently had its last issue and to commemorate we have a full tribute to Nintendo Power featuring memories from fans throughout the years. Our Holiday Buyer's Guide will let you know what games are the hottest this holiday season. To subscribe to Pure Nintendo Magazine, simply visit http://purenintendo.com/magazine/.